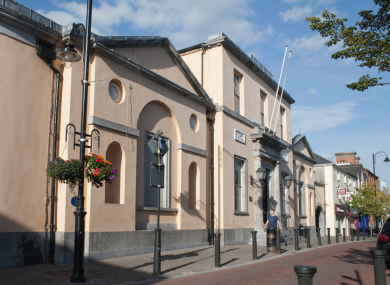 THERE ARE CALLS for Portlaoise Courthouse to be moved after a mass brawl broke out in the town centre last week. Labour Senator John Whelan said the issue needs to be dealt with “as a matter of great urgency”. Around 25 gardaí were called in to calm the situation after the mass brawl broke out at the courthouse last week. Whelan raised the issue in the Seanad yesterday. “No town should have to endure the terrifying scenes visited on Portlaoise’s main street on Thursday last. They have led to a local outcry and I have been inundated with hundreds of representations. “For many, the incident was the last straw. Up to 60 people were involved in a wholesale chaotic brawl, fisticuffs and dangerous scenes of violence along the town’s main street outside the courthouse. What we had on Thursday last was a fracas which reached a new low, but this is not a new phenomenon. It is a daily occurrence, to the point where the people of Portlaoise … cannot move up and down the main street safely owing to anti-social behaviour by gurriers and gougers who hang around in large groups. Whelan had previously raised the subject with former Justice Minister Alan Shatter on several occasions. The Labour Senator said the courthouse building itself is very old, adding that the location “leads to security concerns and traffic hazards” and is “seriously detrimental to the conduct of business and shopping in the town centre”. He said the problem is “further compounded” as Portlaoise now caters for the district court sittings which previously took place in Rathdowney, Abbeyleix, Mountmellick and Portlarlington, along with family law cases, Circuit Court hearings, and special sittings due to Portlaoise being home to two high security prisons. Junior Minister Kevin Humphreys was speaking in the Seanad yesterday on behalf of Justice Minister Frances Fitzgerald. He noted that the courthouse, a neoclassical building built in 1805, was last refurbished by the Courts Service in 2001 at a cost of €2.75 million. More recently in 2010, minor works were carried out to relocate staff to the former grand jury room in the building. Humphreys said the Courts Service “does not agree that the courthouse building is unsafe”. However, he did admit its location in the centre of the town “poses issues for access and security”. In 2007 it was proposed to provide a building on an alternative site, as part of the Courts Service courthouse refurbishment programme. Several potential sites were considered during 2007 and 2008, but none were acquired. Humphreys said the Office of Public Works is “actively looking for an appropriate site, but, as yet, no suitable sites have become available”. He added that the Courts Service has included the provision of additional holding cell facilities in Portlaoise in its programme of works for 2015. “This work will impact positively on security and traffic flow around the court, as prisoners will not have to be held elsewhere and transported to and from the court, to the Garda station or prison vans, as cases are called,” Humphreys told the Seanad. Whelan said he was “heartened that there is agreement in principle that the courthouse is in the wrong place and must be moved”. “If the main impediment is identifying and securing a suitable site, all stakeholders and interested parties should work towards that end. “No town should see its citizens and residents fearful of visiting their main street in broad daylight. This has to stop, and the court is the heart of that problem,” Whelan added. Email “Calls for Portlaoise Courthouse to be moved after 'mass gurrier brawl'”. Feedback on “Calls for Portlaoise Courthouse to be moved after 'mass gurrier brawl'”.